In a challenge for Detroit, teens put off getting their licenses and buying cars. If teenagers are any guide, Americans’ love affair with the automobile may no longer be something car makers can bank on. 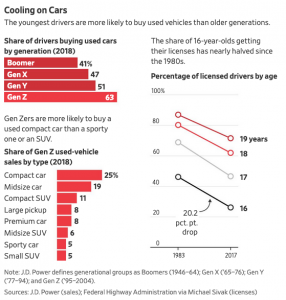 The percentage of teens with a driver’s license has tumbled in the last few decades and more young people are delaying purchasing their first car—if buying one at all, say analysts, generational experts and car industry executives. About a quarter of 16-year-olds had a driver’s license in 2017, a sharp decline from nearly half in 1983, according to an analysis of licensing data by transportation researcher Michael Sivak. Whereas a driver’s license once was a symbol of freedom, teenagers are reaching their driving age at a time when most have access to ride-hailing services such as Uber and Lyft to shuttle them around town. At the same time, social media and video chat let them hang out with friends without actually leaving the house.